Founded in Rome in 1988 by Alessandro Russo, guitarist with a unique and most particular style, Les Hot Swing draw inspiration from the small European string bands of the 30's and 40's, and particularly from the most famous of all: the Quintette du Hot Club de France featuring Django Reinhardt and Stéphane Grappelli. In the repertoire of LHS, beside a choice of standards and Django Reinhardt evergreens, it is possible to find italian songs from the swing era, gypsy music, original compositions and more, where love and respect for the music always mix with a healthy dose of humour: their live show is a hard to forgive experience! The activity of the band ranges from the usual club gig to jazz festivals and national tv programs appearances. 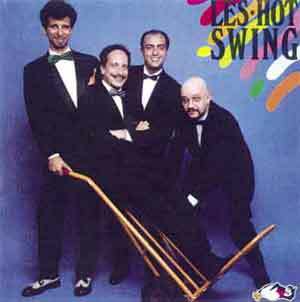 Their first album Les Hot Swing (New Sound Planet/Hi, Folks!, 1989) has won the recognition of almost every music magazine, establishing LHS as one of the best and more original tradizional jazz band in their country. Alessandro Russo's striking virtuoso qualities and funny creativity are well at home in a style that relates directly to the great Django Reinhardt, while finding a more personal formula incorporating the many influences collected throughout his frequent travels. Stefano Tavernese's multiform instrumental talent, tempered in the course of a long and rich career (which brought him lately to touring and recording with the great prog-rock band PFM) and his deep familiarity with every musical genre, gets mixed with an 'old wave' taste and delicate sense of humour. In Les Hot Swing, Tavernese is the tasteful répecheur of pre-war swing ways, of which he's an extraordinary vocal interpreter. Acoustic bass player Piero Piciucco and rhythm guitarist Jacopo Benci, finally, are instrumentalists rich of taste and experience, creating a solid background for Russo and Tavernese to unfold their talent.